﻿ "Manipulating Social Media to Undermine Democracy"
Freedom House in its report Freedom on the Net 2017 concludes that online manipulation and disinformation tactics played an important role in elections in at least 18 countries over the past year, including the United States. Disinformation tactics contributed to a seventh consecutive year of overall decline in internet freedom, as did a rise in disruption and restriction to mobile internet service. 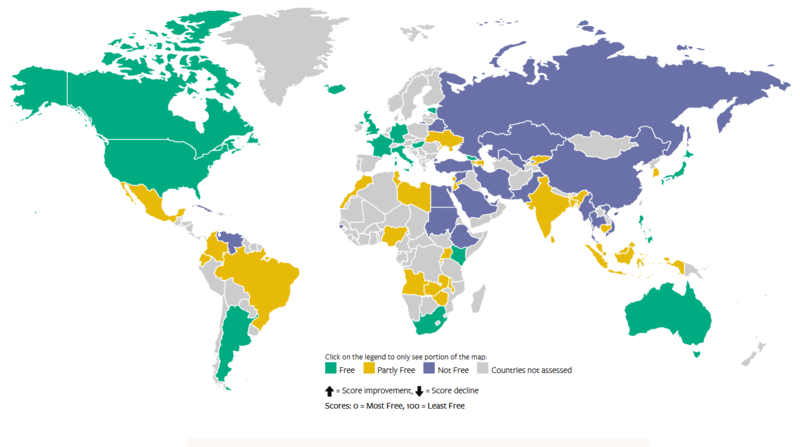 Freedom House also concludes that China, for the third consecutive year was the world’s worst abuser of internet freedom, followed by Syria and Ethiopia. “A record number of governments have restricted mobile internet service for political or security reasons, often in areas populated by ethnic or religious minorities”, says one of the key Freedom House’s report findings. Most of them are those who dispute the authority or fight for greater right, such as the Tibetan and Uighur communities in China, and also the Oromo and Amhara populations in Ethiopia. For instance, last year a Tibetan monk was sentenced to 13 years in prison for creating a WeChat group with intention of “offering prayers for Dalai Lama’s 80th birthday”. Physical attacks on netizens and online journalists were reported in 30 countries while Freedom House’s report finds that people were murdered for writing about sensitive subjects online such as corruptions, crime and expressing religious views different or challenging to those held by majority. In April 2017, a student in Pakistan was killed on university campus by a mob of fellow students that accused him of posting blasphemous content online. A Christian writer was shot dead outside a court in Jordan where he was charged for offending Islam by sharing a cartoon on his Facebook profile. Freedom House in his report states that those attacks on freedom of speech online not only strengthen the notion of self-censorship but it is especially harmful when the government fail to punish perpetrators, which in other way perpetuates a cycle of impunity. The report also estimates that 47% people are living in countries where online discussion of LGBTI issues can be repressed or punished. This is obvious in Russia with the law against promoting “non-traditional sexual relations”. According to the report, LGBTI internet users were censored and penalized “with at least one social media user forced to pay a hefty fine for commenting on LGBTI issues”. In the similar way, six television programs for children broadcasting online were banned by the Kenya Film Classification Board (KFCB) for “ostensibly promoting homosexuality against our Kenya’s moral values and culture”.